Windows 10 feature updates rarely roll out without some issues, but the Windows 10 October 2018 Update seems to be having more than its fair share. While some users are complaining the update has deleted their personal files, others are finding the upgrade has been blocked due to an incompatibility with systems running 6th generation (Skylake) or newer Intel processors. The problem relates to Intel Display Audio device drivers and according to Microsoft, installing the latest feature update can result in "excessive power demand and reduced battery life." On the "What needs your attention notification", select the back button to remain on your current version of Windows 10. To ensure a seamless experience, we are blocking devices from being offered Windows 10, version 1809 until updated Intel device drivers are installed on your current operating system. See knowledge base article 4465877 for further information. We recommend that you do not attempt to manually update to Windows 10, version 1809 using the Update Now button or the Media Creation Tool from the Microsoft Software Download Center. Wait until newer Intel device drivers are available with the update. This page will be updated when the block has been removed. 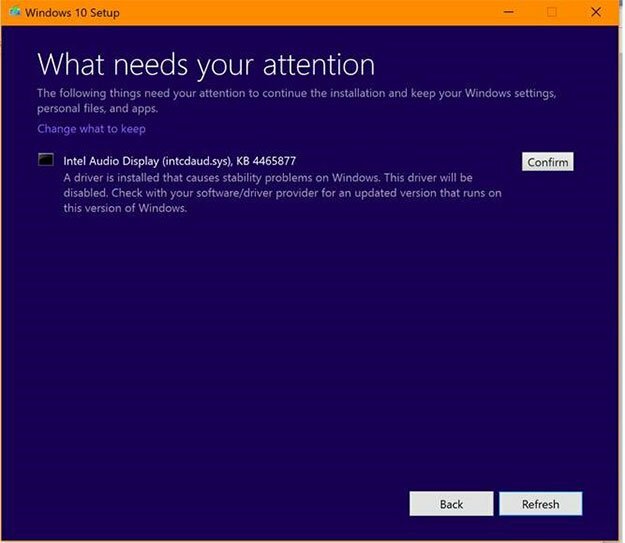 You can opt to wait for newer drivers to be installed automatically through Windows Update or check with the computer manufacturer for the latest device driver software availability and installation procedures. For more information, see Intel's customer support guidance. If you have Intel Graphics Driver 24.20.100.6286 or later on your PC then you likely won’t encounter the problem as it comes with an updated version of the problematic Intel Display Audio driver.